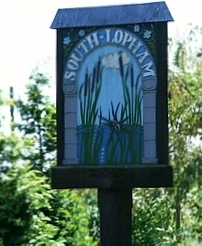 At the Lophams’ Society AGM held as part of the Lopham’s Village meeting on the 11th April, the chairman gave an update of events held over the past twelve months including the recent March quiz which proved to be the most successful ever. Following his report Granville Horan announced his intention to stand down as chairman having held the post for several years. Fortunately this past year the society has seen several new members join the committee and therefore was pleased to receive a nomination from Roy Clark who was duly elected as chairman and also from David Hammond who was elected as vice chairman replacing Alan Gaynor who also decided to stand down. At the conclusion of the AGM a vote of thanks was proposed for all Granville’s hard work on behalf of the Lophams’ Society. The society would like to take this opportunity to express its thanks to Nigel and Tracy Martin, landlords of The White Horse in South Lopham for their most generous donation of £500 raised at a number of fund raising events held at The White Horse over recent months. This donation will go towards funding this year’s Christmas drop-in event to be held on the 12th December. The Lophams’ Society was delighted to be chosen by The White Horse to receive this amount and we wish them every success in all their future events which will benefit other causes across the Lophams. The next Lophams’ Society event will be a jazz night featuring Jazzamazoo on the 19th July at the Lophams’ Village Hall.